In a letter to the bishops of the Buenos Aires region in September 2016, Pope Francis had for the first time given a hint for the correct interpretation of his post-synodal letter "Amoris Laetitia". It read: A permission of remarried divorcees for communion in the individual case is provided. This endorsement means that the Church will be further wounded by sacrilegious communions. The Argentine bishops provide for the admission of remarried to communion in individual cases. The Pope first confirmed this interpretation of "Amoris laetitia" in a private letter. 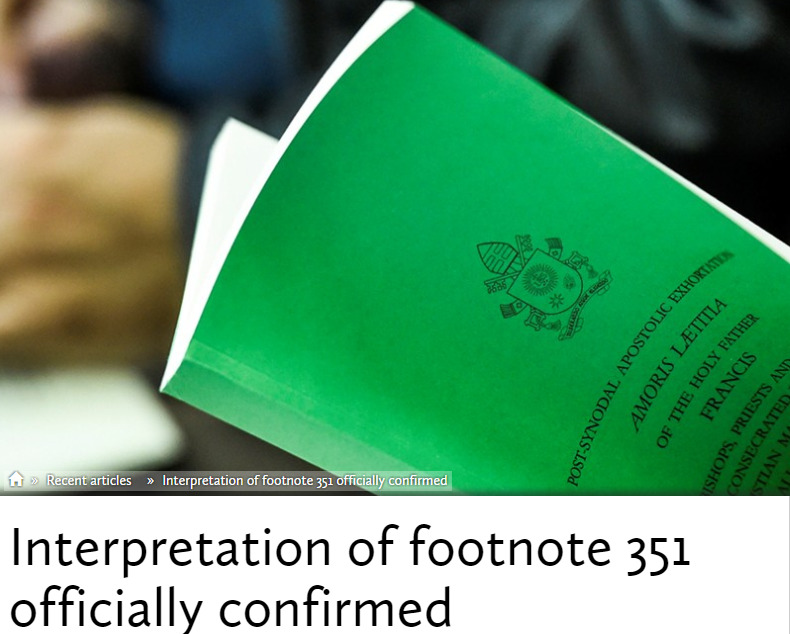 Now he makes it official: through a publication in the Official Journal of the Holy See. What Pope Francis has repeatedly emphasized is now official: At the communion reception for remarried divorcees, the middle ground is that in individual cases admission to the sacraments of reconciliation and the Eucharist is possible. A letter from the Pope dated September 2016 and guidance has now been published in the Official Journal of the Holy See - with the addition of Cardinal Secretary of State Pietro Parolin that the texts are "authentic Magisterium". The two documents, to which Parolin's "Rescript from an Audience with His Holiness" refers, are a guide to the post-synodal writing "Amoris laetitia", which bishops from the Argentine pastoral region of Buenos Aires published for their clerics on September 5, 2016, and the same day a reply from Francis to the bishop of the Diocese of San Miguel, Sergio Alfredo Fenoy. In it, the Pope confirmed the interpretation of "Amoris laetitia" by the bishops of the region. "The text is very good and explains exactly the meaning of the eighth chapter of 'Amoris laetitia'," it says in the letter of the Pope. "There are no other interpretations." The controversial chapter is about "Accompanying, differentiating and integrating"
Francis goes on to write that "Amoris laetitia" is the "fruit of the work and prayer of the whole Church, with the mediation of two synods and the Pope." He emphasized in the letter written in Spanish that post-synodal writing is not an arbitrary product of the Pope. For hardly a papal document has triggered such inner church controversy as the "Amoris laetitia" published in April 2016 and its famous footnote 351: remarried divorcees could under certain circumstances also receive the "help of the sacraments," it says. This bites off the doctrine of the church, some interpreters, especially four cardinals, said to the Pope their "Dubia" (Latin doubt)to send. According to the teachings, the marriage was insoluble and those affected lived in a continued state of grave sin. Since the publication of "Amoris laetitia", several episcopal conferences and individual bishoprics have been discussing implementation guidelines; they were - as in Malta - sometimes more liberal, or as conservative in Bologna. The Argentine bishops' interpretation, on the other hand, interprets the Pope's letter on the middle ground between rigorism (no communion reception because the second civil marriage means breaking the first sacramental marriage still in force) and laissez-faire (communion for those who agree with their conscience can). The chief shepherds warn against talking about "permission" to receive communion. Their interpretation does not include "unrestricted access to the sacraments" for Catholics in all circumstances, respect for sensitivities in parishes, and adherence to the doctrine of the indissolubility of marriage. Remarried divorcees should be encouraged to engage in sexual abstinence or participate in ecclesial life without sacraments. However, in individual cases, following a "path of distinction" with a clergyman, there should be an opportunity to seek the help of the sacraments of reconciliation and the Eucharist. Both texts, the Argentine Guidance and the papal reply, were printed on 13 September 2016 in the "Osservatore Romano", the semi-official Vatican newspaper titled "Distinction and pastoral care". In the weeks before , the paper had also published several articles that pointed "Amoris laetitia" in this direction. But only with the adoption into the official gazette of the Holy See is it binding in the canonical sense. These "Acta Apostolicae Sedis" (AAS) usually appear with a delay of several months and are therefore hardly considered medial. The Vatican sometimes chooses this path if it wants to casually put things into action. About the now published AAS, which are dated to October 2016, have reported at the weekend, first traditionalist blogs from the United States. In the Official Journal, the two documents appear in Spanish, but with introductory headings in Latin. The (private?) Letter of the Pope became such an apostolic letter. At the end is the short decree, which is based on an audience of Parolins with the Pope and bears the date of June 5, 2017. It states in Latin that the pontiff had issued that the two documents be promulgated by the publication on the Vatican website and in the AAS as an authentic teaching office. In fact, the letter is also found online under Pope Francis' letters .